A deluxe hardcover edition of Patrick Ness’s masterpiece features the entire illustrated novel as well as more than one hundred pages of extraordinary film-inspired content. 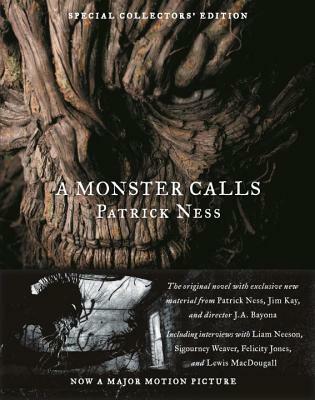 Patrick Ness is the author of A Monster Calls and More Than This, both of which were awarded the Carnegie Medal, as well as the critically acclaimed and best-selling Chaos Walking trilogy. Among the numerous awards he has received are the Guardian Children’s Fiction Prize, the Booktrust Teenage Prize, and the Costa Children’s Book Award. Born in Virginia, he lives in London. Jim Kay is the illustrator of Patrick Ness’s A Monster Calls as well as The Great War: Stories Inspired by Items from the First World War, an anthology of short stories. Jim Kay studied illustration and worked in the archives of the Tate Gallery and the Royal Botanic Gardens at Kew, two experiences that have influenced his work. He lives in Edinburgh, Scotland.